Born on Long Island and schooled in the kitchens of French chefs Daniel Boulud and Guy Savoy, Adam Perry Lang is an unlikely barbecue guru. Since winning his first barbecue competition 14 years ago (he entered on a dare), Perry Lang has rewritten the rules of grilling, dry-aging and smoking meat. After graduating with distinction from the Culinary Institute of America (CIA) and training at some of the top restaurants in the world, including Le Cirque and Daniel in New York City and Restaurant Guy Savoy in France, Adam abandoned the pursuit of Michelin stars to follow a passion for Live Fire cooking. Adam opened his first restaurant, Daisy May’s BBQ in Hell’s Kitchen in 2003. Knowing that credibility in the barbecue world comes from winning competitions, Adam set out across the country with a smoker to make his mark. In his first year on the national barbecue circuit, Adam won Grand Champion honors at the World Pork Expo and first place at the American Royal World Series of BBQ in the Pork Shoulder Competition. 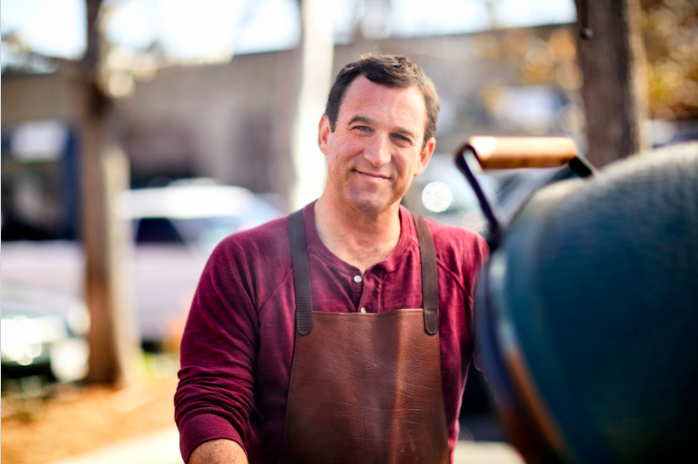 Adam is a New York Times bestselling author, with three books: Serious Barbecue, BBQ 25, and Charred & Scruffed. To hear him tell it, Perry Lang's segue from world-class French cooking to wood-fire barbecue pits makes perfect sense. "There are many parallels between French cooking and barbecue, including the snobbery." Adam found success applying classic French cooking techniques to live fire cooking - opening restaurants with Jamie Oliver in London, running the dry-aged beef program at Carnevino Italian Steakhouse in Las Vegas and, most recently, his wildly-popular annual backlot BBQ pop-ups at "Jimmy Kimmel Live" in Hollywood. His latest venture—APL Restaurant—aims to elevate the contemporary steakhouse with inspiration from those of the late 1800’s and early 1900’s. The 150-seat restaurant is situated on the ground floor of L.A.’s first-ever high-rise, the Taft Building, built in 1923 on the corner of Hollywood and Vine. At APL Restaurant, Perry Lang’s hand-forged knives will demand as much attention as the underground dry-aging room. Perry Lang studied knife-making at the New England School of Metalwork and has a metal shop in Wildomar, CA, where he makes stainless steel, acid-etched Damascus steel blades. Inside, APL Restaurant takes a new look at the standard leather-bound, mahogany-paneled, Cabernet-soaked steakhouse with design direction from Sami Hayek and Kathy Delgado. “At the end of the day, it’s a steakhouse. My passion is beef,” Perry Lang says, with a mouth full of beef. Opening April 2018, APL Restaurant is located at 1680 Vine St, Los Angeles, CA 90028.